Nasir Ali trumpets are ideal for beginner to medium level or student musicians. 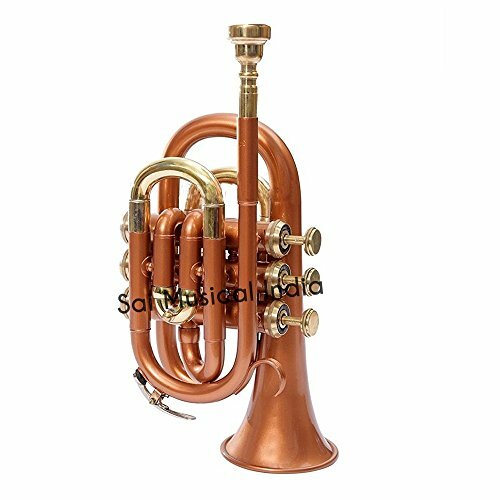 This pocket trumpet features a phosphorus copper lead mouth pipe, with 3 smooth action valves. Every pocket trumpet is play tested at our factory and re-tested by a professional to ensure that their high-quality standards are met. This is why thousands of instructors have approved these trumpets. This pocket trumpet package includes a hard shell case, a pair of gloves, a soft cleaning cloth, and a bottle of valve oil. Buy with confidence as it comes with a 14 months warranty against any manufacturer"s defects. Includes a carrying case, bottle of valve oil, soft polishing cloth and a pair of white gloves. Phosphorus copper used on lead mouth pipe. Smooth action valves, & comfortable white faux mother of pearl inlaid buttons. 14 months Warranty Against Manufacturer's Defects. If you have any questions about this product by NASIR ALI, contact us by completing and submitting the form below. If you are looking for a specif part number, please include it with your message.